I'm just writing to let you know how much I have been enjoying your winter photos while I toil away at work in Florida. Also, I'm curious if you are shooting your panoramas with your camera in the vertical position. 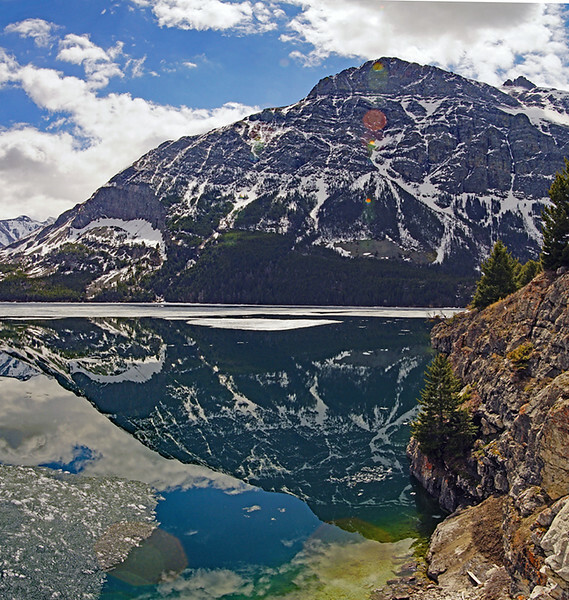 That allows for more room at the top and bottom of the image so the panorama can be cropped for the best composition. Thanks Carol. I always appreciate your comments and criticism. And yes, I do make some panographics with camera in vertical position. And thank you for your email. Yes, my Dad was/is a big influence. I didn't care for my original post. It "blathered on" too much. Here is the image I made last week with camera in portrait position. Image is a 6 frame panographic. Full image size is 21,275x6638 pixels and focus/sharpness is good..
Live and learn as the old saying goes. No pano prints for the geezer in the foreseeable future. For example, the image above when printed in a small test print, showed considerable lines in the sky are where the software stitched together the images. Neither of my computers has anywhere near the hardware capability to run Lightroom or Photoshop. So, for now, I just work on "regular" single images. Crappy, rainy day but got a few decent creek images. Should be up shortly. Leaving for a car camping trip at St Mary. Depending on weather, I may stay and drive back early Monday. While the weather is lousy today(possible snow/rain), it's supposed to be good tomorrow. I'll drive to Rising Sun, bike up to Sunrift Gorge, then hike up Baring Creek for pictures. Sorta like last year but I should have more time for hiking since I won't be driving over for a day trip. Should be fun. I doubt many people will be around due to the weather, but who knows. Maybe I'll see some animals this trip and get some pics. Pete, From the look of the webcams you should be having a great day weatherwise. Can't wait to see your pictures. indiana hiker wrote: Pete, From the look of the webcams you should be having a great day weatherwise. Can't wait to see your pictures. Unfortunately my trip turned out to be a bummer. It rained/snowed/sleeted all day and intot he night Saturday....which was ok since it was predicted. However, when I got up to a GORGEOUS Easter Sunday morning, I felt really lousy--G.I. problems. Then I got leg cramps in my calves...and generally felt tired, even though I slept well--except when the coyotes "sang"
So I spent the morning just chilling out hoping the G.I. business would relent. I felt a little better about noon. So I loaded up gear and frove to Rising Sun. After riding to the Wild Goose Overlook, I began feel lousy again. Thankfully just fatigue and not the G.I. stuff. Then as nice as the day was, as afyernoon progressed, it looked like thunderstorm clouds were building up towards the Divide. So I took a few more pics and decided to come back home. Here are a couple pics that looked ok.
About an hour later, the sky began to look worse, especially over the area northwards over Baring Creek. And I began to feel lousy and tired again after just that short ride up to Wild Goose Overlook. So maybe it was for the best that I didn't get up there. I rode back down to the big overlook parking area. I made this one perched on the edge of the cliff below the "safety" rock wall at the parking area. 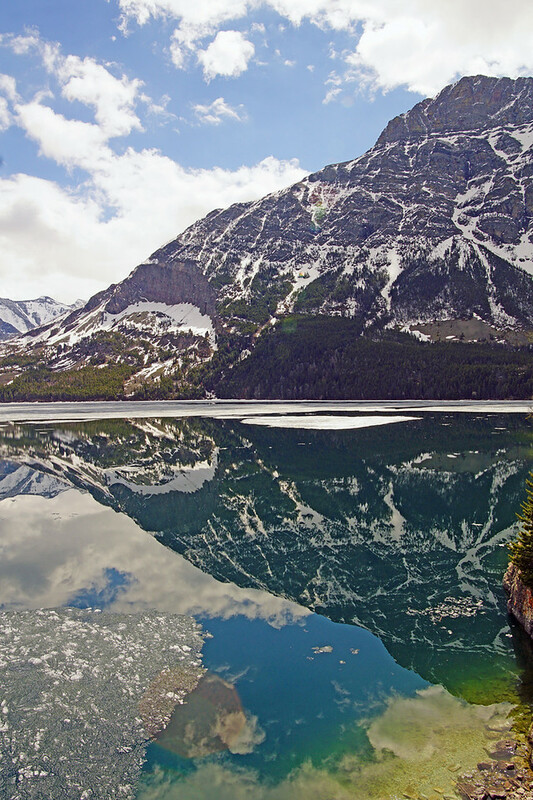 The ice combined with the reflection of the Red Eagle Mt., the blue sky with white clouds made a different sort of shot. 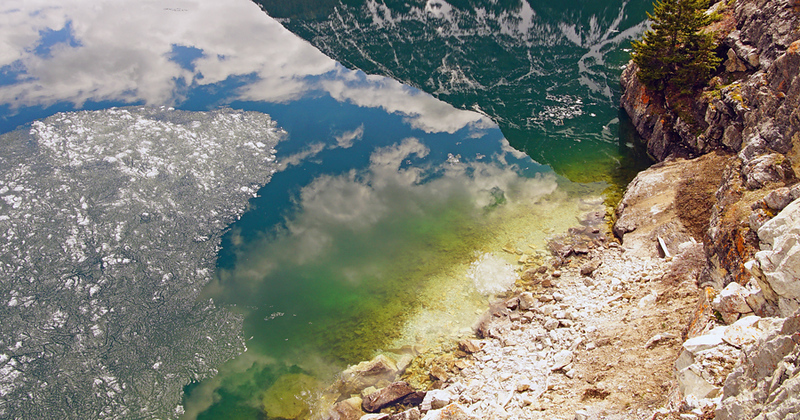 The greenish tint is how the shallow water looked. Down near the bottom, that is a reflection of an overhead cloud on top of a "reflected" cloud. It shows as a "shadow" on the white reflected cloud. I may have a better shot of Red Eagle and reflection. Not had a chance to look through all of the images yet. The difference in shades of blue in the sky and reflection is due to differences in lighting, how the water reflects the image, and how the camera "see" it all. ....I think. Anyone know for sure? Pete, Too bad you weren't feeling well. The webcams looked so good, I'm disappointed the camera weather looked better than it actually was. Enjoyed your pictures and hope you are feeling better. At least since the weather wasn't perfect, it makes heading home early a little easier. Seems like a lot of snow the last couple of weeks. Heading out the end of June, to avoid the fires this year and hoping the road will open while there. indiana hiker wrote: Pete, Too bad you weren't feeling well. The webcams looked so good, I'm disappointed the camera weather looked better than it actually was. I probably should correct my opinion of the weather. The weather was great all day down in the lower St Mary Valley. And from what I could see from my tent, it was good farther up the valley in the early morning. As the day progressed, the clouds built up everywhere, but moreso near the Divide. Has I been able to get going on my bike no later than 8AM, I'm sure I could have gotten some good images in the Baring Creek drainage in the morning. After about Noon, the white/grey cumulus clouds were building faster "up valley". That makes for a sky that the snowy mountains sort of "blend into". Not enough contrast for good separation/definition for lack of a better term. Early on in these conditions, the clouds are nice white puffy cumulus clouds and make much better images---imo. So the weather was good, just not to my liking later in the day. Enjoyed your pictures and hope you are feeling better. Thanks and yes, I feel a lot better today. As a "penance" of sorts , I hiked up the Sperry trail to the Mt. Brown junction(1.5 miles), then another 1/2 mile up the Mt Brown trail to the 4800ft elevation in about 1:45 minutes. 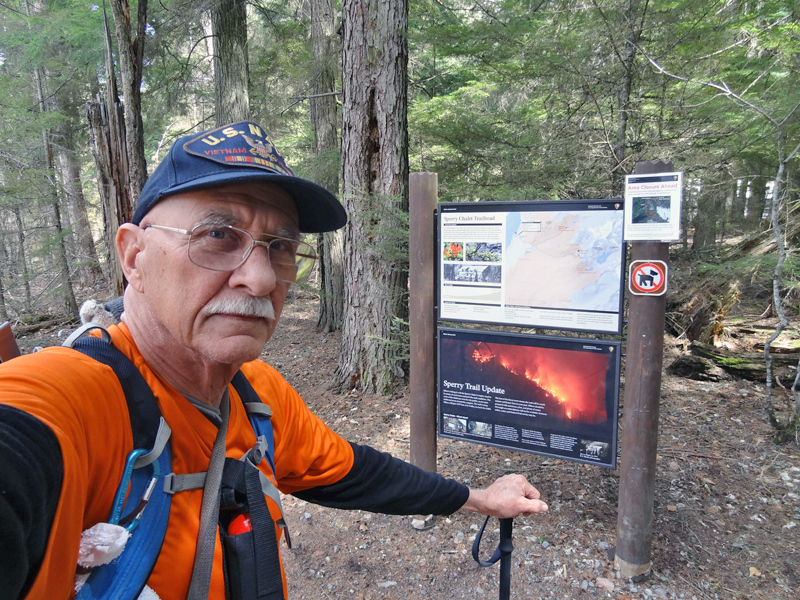 Stopping often for video and pics of some of the Sperry fire burn area. Good workout. Got down in just over an hour. I'll post pics and video later. At least since the weather wasn't perfect, it makes heading home early a little easier. Seems like a lot of snow the last couple of weeks. Heading out the end of June, to avoid the fires this year and hoping the road will open while there. Good idea about late June. GTTS road should be opening in time for you to get to Logan, especially from the East side. West side may be delayed because of construction/repairs if I recall. I like late June early July. Mountains still have lots of snow which makes good pics and earlier flowers are usually starting to bloom well. Here is another image that came out well in spite of the lens flare. Maybe I can "Photoshop" the flare out of the image? Not much I could do about the flare as I was shooting directly into the sun which was not far out of the frame. The time was around 1:30PM. I was just lucky that this part of the lake is somewhat sheltered from the wind coming down the lake. Waiting for the sun to move may have meant losing the reflection. The color in this shot is better than the image about. This is a two frame panographic made by turning the camera 90 degrees into the portrait position. Lens was my 16mm wide angle and I was too close to get everything in the image that I wanted shooting it in landscape position. A wide angle lens isn't usually a good choice for a panographic image, but here I think it worked ok. The color is better in this image imo. The light kept changing due to clouds constantly moving across the sun. I really like the composition here. I walked up and down that damn rock wall (it curves, making it harder) for 10-15 minutes. There were several other places that may have been as good, but there was no place I could get over the wall and on the cliff edge for this shot. I needed to find a place I could get everything I wanted to include--without the rock retaining wall in the frame. BTW...this image was cropped only very slightly. But then it is my picture, right? I'll have a few pictures and video of the Mt Brown area this evening. People should not be concerned about hiking the Sperry Chalet trail. Granted I saw only a portion of the burn area. However,the burn areas I did see were pretty typical of most forest fires. Some parts burned hot charring trees to the cambium and killing them. Some trees were not burned at all. The fire cleaned out most of the underbrush opening large areas for wild flowers and other typical under story growth. 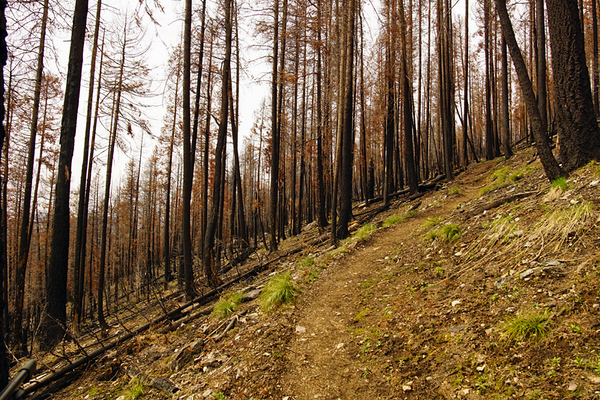 I believe the Sperry fire burn area will be a beautiful place to hike through in the coming years. 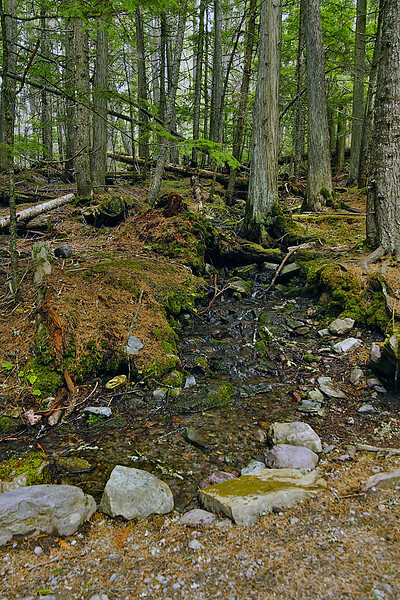 Bring sufficient water with you on the Mt Brown trail as it is DRY. And beware of all the standing dead trees on windy days. 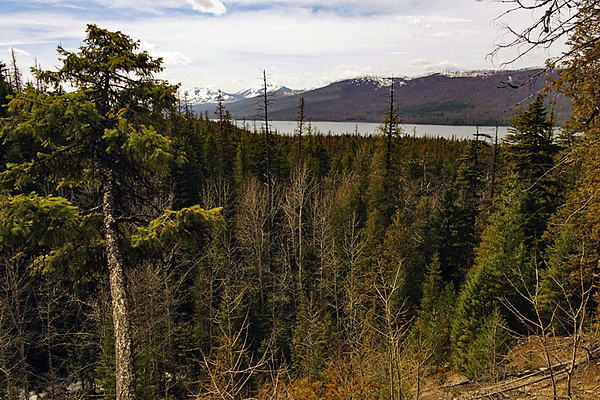 Here's a few snaps from my short hike up the Sperry and Mt Brown trails. Didn't start till 2Pm since it was a spur of the moment trip after work. The pictures here are from just of a fraction of the large burn area. The Sperry fire burned in a typical mosaic pattern. Some areas burned badly while some escaped damage. No sign of the fire down low. After about 3/4 of a mile You get into the burn. 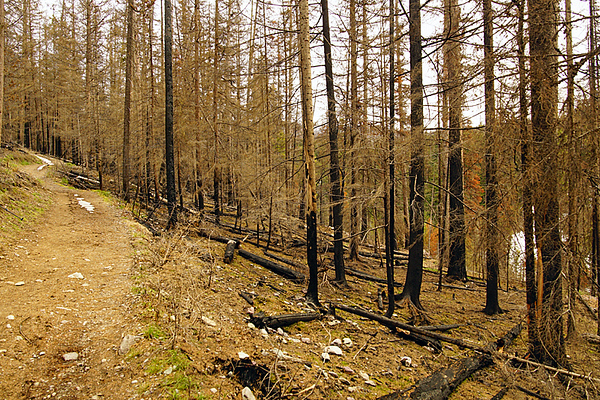 Hikers should be very cautious when hiking through the burn areas. There are many standing dead trees like this. This tree is about 50ft tall and weighs tons...all supported by that section that's less than a foot in diameter. This tree has been standing like this since the fire in August 2017. It could stand another two years, or fall tomorrow. No way to know. 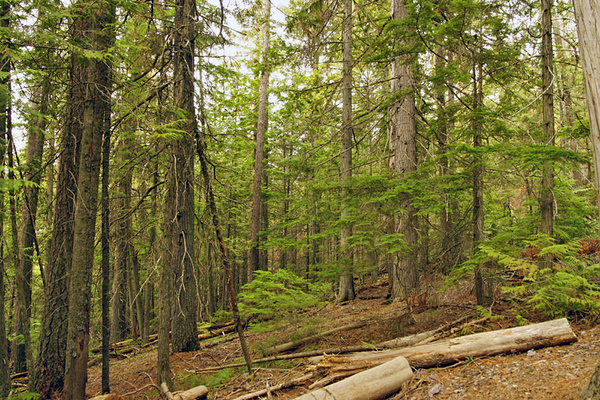 If you get caught hiking this area and the wind begins to blow, be especially careful. Sometimes the damage is not as obvious as the tree above. 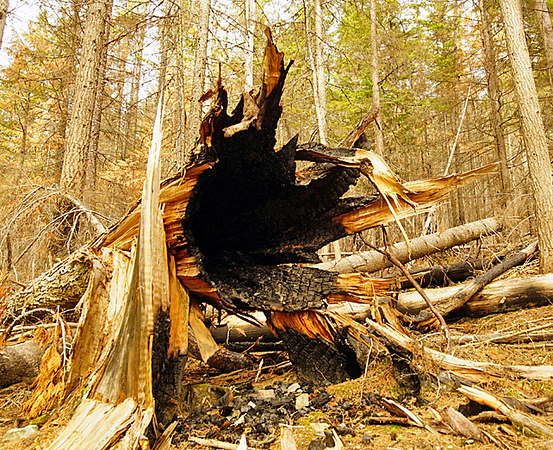 The fire will burn out the root system weakening it. This was taken on the beginning of the Mt Brown trail. You can see how the fire doesn't burn everything, but in a mosaic pattern with green areas mixed in the burn. 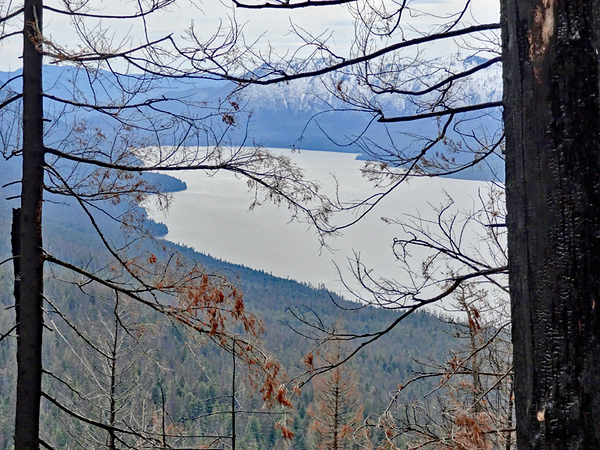 A look at Lake McDonald from near where I stopped at about 4800ft in elevation. The fire opened up a lot of places for views. The trail up Mt Brown was always a grind. Now it will be a hot grind in the summer sun. Carry water as there is NO water on the 5 miles up to the Mt Brown Lookout. Same spot as picture above. I turned around here. 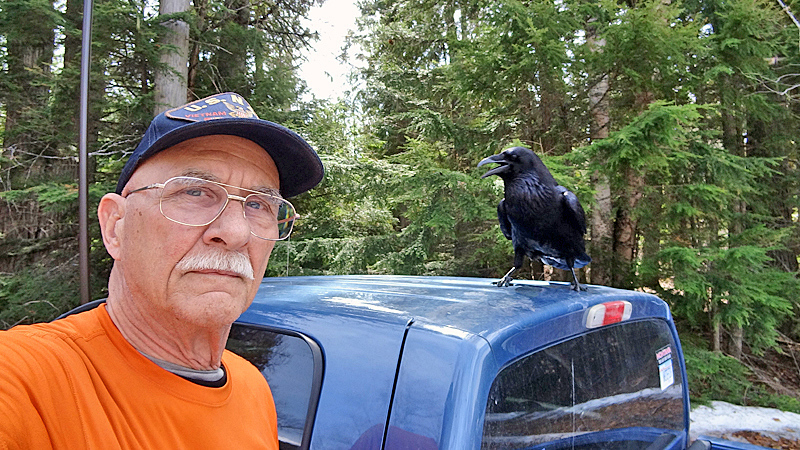 I didn't see Clyde when I drove in, but by the time I got out of Jaybird, he'd found me. I haven't seen Bonnie in a couple weeks. I hope she's on her nest. The problem with GI problems is that when someone knocks, you have to answer the door....quickly. Good to hear you’re humpin’ up Brown. I want to do that one at some point. Gotta go. Interesting pictures of Red Eagle and St. Mary Lake. Those are quite the reflections and I am sure Jay could write refraction and reflection formulas for determining the color at various angles. Nice to see pictures from the Sperry trail. 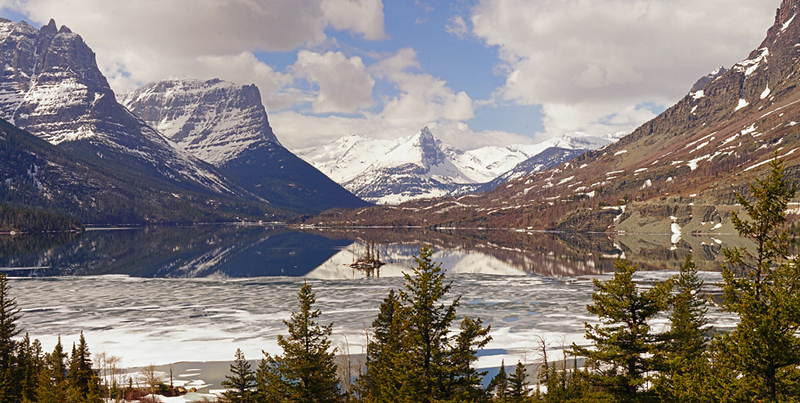 It looks like spring is coming to Glacier - at least at the lower elevations. 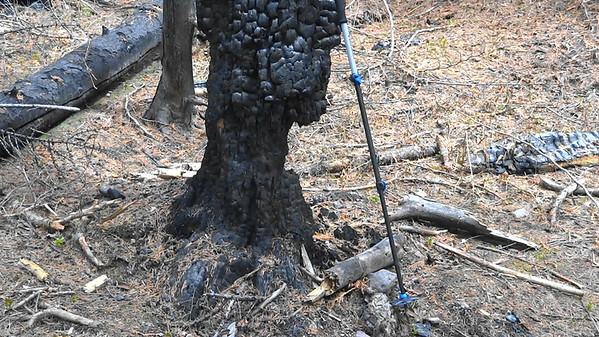 You are right about watching out for those trees that have parts of their trunks burned - I remember looking at a tree with a hollow (burned out) base along the St. Mary Falls trail in September 2017 and wondering how long it would stay upright. And I am late on this - I do like those fence line pictures you posted from the east side several weeks ago. A number of our fences were completely buried by snow drifts this past winter. Our fences have one wire that is electric and two or three non-electric wires. As the snow melted it pulled the electric wire down out of the insulators that fasten that wire to the posts. I had to replace about half of those insulators (they are plastic) as the snow melted to keep the electric wire from grounding out against the steel posts. am enjoying your posts as well. Thx for the trip up the Sperry Trail. Looks a little scary in parts. 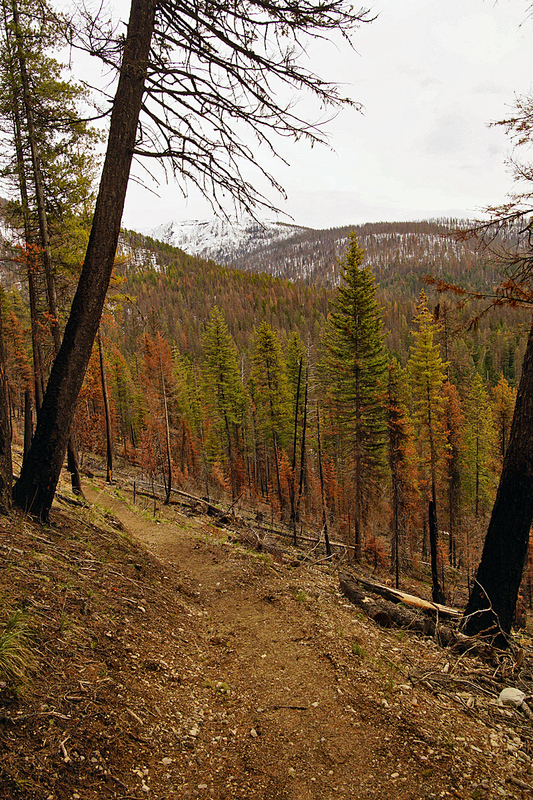 And I still can't imagine hiking that Brown's Summit Trail, with or without trees . I just hiked thru a burn area up on Oracle Ridge by Tucson. It burned in 2003 but a lot more severely then the mosaics you showed us. That fire burned for a month. Anyway, it's always interesting hiking thru burn areas even 17 years later. I remember the fire but I didn't realize how long ago it was. I think it completed changed the Summerhaven community up there on Mt Lemmon.